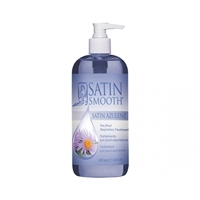 Satin Smooth beSmooth® Sanitizing Skin Treatment Lotion provides a clean and hygienic finish to hair removal services. A pre-depilatory antiseptic tonic to ensure hygienic, comfortable wax service. A post-depilatory cleansing oil, for removing wax residue. Aloe Vera skin soother is a post-depilatory naturally soothing antiseptic gel. Dual-purpose formula pre- and post-depilatory. Calming chamomile derivative. Prepares, calms and soothes skin.